Non-Bio are pleased to announce our next live date, which is to take place at The Scream Lounge, Croydon on the 5th January. We are playing at the launch party for the new album The Enemy Game by Daniel Vincent, along with Dominic Hemy, Gimnastic and MOX. It will be a great night! 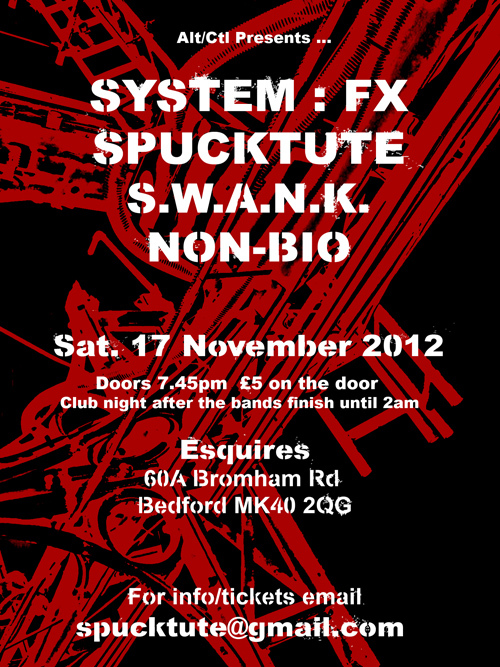 On Saturday 17th at Esquires, Bedford Non-Bio finally put on a live show. It was the furst time in five years that I'd stood on-stage as part of a band and the first time ever that I'd fronted a band or played my own material. Attendance at the event (Alt+Control Reloaded) suffered a bit as a result of scheduling clashes with other events, although it did pick up a bit later in the night; we were the first band on, followed by S.W.A.N.K., Spucktute and finally System:FX. Oh, and we were wearing tin-foil hats for this song. It's strange and interesting to see how we looked on stage; my voice sounds different from here than it did through the monitors too (I should have turned the effects up higher) but that's all part of the learning process. We're hoping to do another live show in January (TBC) and will try and incorporate some lessons learned here. But I'm generally very pleased with how it went - no mishaps and the half hour set seemed to last only about five minutes from our perspective! A brand new song here from Spucktute! I took a lot more photos of everyone there but so far I've had time only to put them on Facebook. None of the equipment broke down - not even the home-made instruments - and Karl proved to be an excellent Noizitar player (arguably the world's finest!) and the promoters nad other band people were all awesome too. So yes, a successful night I'd say. I even sold a T-shirt! i'm sure you don't need reminding but our gig is this Saturday, 17th November at Esquires in Bedford. It's here! Check out the new video, it's a monster. Find out more about the making of this video on my official site: downwithfreedom.com. Also on the subject of Beer Monsters, check out this awesome new remix of the track by The Digitariat! Check out the new collaboration between Non-Bio and Spucktute!